Founded in January. Launched in March (see their FinovateSpring 2013 demo). Acquired in August. That pretty much sums up a very productive 2013 for online tax preparation/planning software company, GoodApril. The company announced on Thursday that it had been acquired by financial services giant, Intuit, for an undisclosed amount. GoodApril had been scheduled to make their pitch at Techstars Boulder/Denver Demo Day when the news broke. Undaunted, the innovative startup made its presentation anyway, a presentation that must have seemed as much acceptance speech as elevator pitch. GoodApril’s Tax CheckUp solution allows users to anticipate and prepare for potential tax liability in the tax year to come. Headquartered in San Francisco, and having only three employees, the company bills itself as the tax software for “the other 364 days of the year.” Tax Checkup analyzes previous tax returns and makes recommendations over the course of the year to ensure that taxpayers pay only what is owed on Tax Day. Intuit has already one popular product in the tax preparation software market, TurboTax. However, like most tax preparation software packages, TurboTax is designed to help taxpayers prepare tax returns for previous years. Good April’s forward-looking approach gives taxpayers a chance to make potentially money-saving changes before it’s time to file. CMS Wire reports: Linkable Networks: Improving the Customer’s Path to Purchase. Lighter Capital appoints Jeff Seely to board of directors. Pymnts.com reports: BillGuard Acts As Antivirus For The Disease Of Fraud. Expensify to begin new pricing structure. Global Finance magazine names Taulia the best worldwide invoice discount management solution. Expensify will soon be made available to over 250,000 Citrix enterprise customers. BillFloat extends SmartPay pilot program with Radio Shack partnership. Newfination interviews Mitch Fox, co-founder of GoodApril. Wired’s Beyond the Beyond column features OpenCoin in a report from the Bitcoin 2013 business convention. ProfitStar’s iPay Solutions named among best places to work in Kentucky. Stock Pick Previews takes a look at TradeKing. Billhighway adds the Friends of Birmingham Historical Museum & Park as new client. Yodlee and Check (formerly Pageonce) are among the companies highlighted in American Banker column on reimagining PFM for mobile. This post is part of our coverage of FinovateSpring 2013. Next up to the stage is GoodApril, with a personal finance management approach to online tax planning. “Today, GoodApril is unveiling its next-generation, automated tax monitoring solution for consumers. NerdWallet profiles GoodApril. See them demo at FinovateSpring in May in San Francisco. California Business Journal takes a look at BillFloat. CSI Enterprises launches globalVCard for Travel mobile app. Cairo Amman Bank to deploy Temenos T24. Kashoo announces updates to its cloud accounting web app. Cardlytics named a Best Workplace by The Atlanta Journal-Constitution for second consecutive year. Virtual Piggy sees 100,000 new active users sign-up since March for its youth wallet solution. Come check out their demo at FinovateSpring. Gartner names Metaforic as a 2013 Cool Vendor in the Security Infrastructure Protection category. Arxan Mobile Application Integrity Protection for IBM Worklight Apps enables IBM Worklight customers to protect their mobile apps against hacking. Come check out Arxan’s new technology at FinovateSpring. ID Analytics introduces new version of Credit Optics Credit Score for more intelligent insight into consumer behavior. Newfination talks to BankBazaar about how it works. RIA Biz takes a look at BrightScope’s plan to make advisory fees public. DietBet.com crowdfunds more than $300,000 via SeedInvest. Join SeedInvest in San Francisco for FinovateSpring in May. 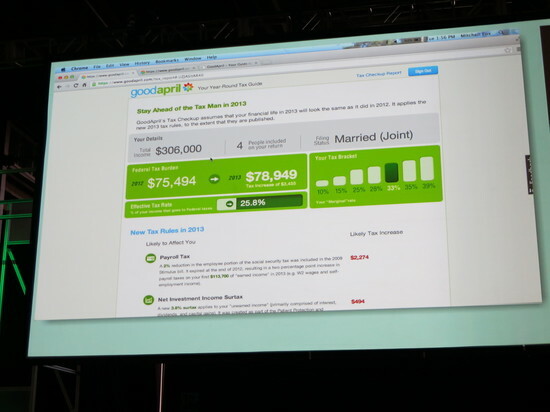 Finovate alumni make a strong showing in GoodApril co-founder’s list of tax preparation innovation. Meet GoodApril at FinovateSpring. VentureBeat features Ripple developer OpenCoin. See OpenCoin in action at FinovateSpring in May. DroidBeans reviews Pageonce for Android. Puget Sound Business Journal highlights the role of Realty Mogul in a local real estate deal. Join Realty Mogul at FinovateSpring. PayPal buys Iron Pearl, a startup that helps companies make their products more attractive to customers. Reuters looks at a case study of how FutureAdvisor is used to save for retirement. New York Times Business Day interviews Sabrina Parsons, Palo Alto Software CEO. Come to FinovateSpring to watch it demo LivePlan. Channelnomics reports: Check Point Launch Makes Small Branch Foray. Dwolla takes top honors at Prometheus Awards in Des Moines. Massolution’s Crowdfunding Industry Report places Lending Club and Prosper as leaders in the industry. American Banker considers On Deck Capital’s growth. 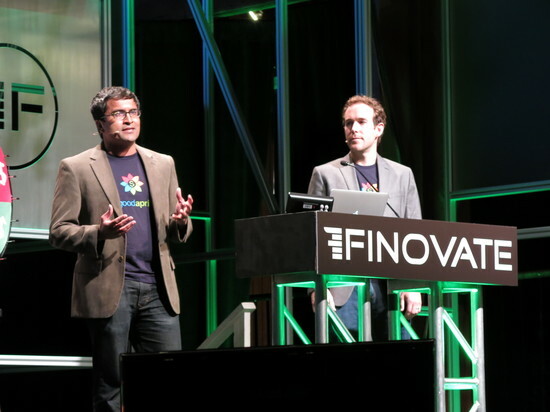 On May 14 and 15, Finovate returns to San Francisco where more than 70 companies will showcase their new technology. The majority will be making their first appearance on the Finovate stage. To be a part of the excitement, Get your ticket here. Balance Financial: is a digital workspace that helps FIs drive revenue growth, improve client engagement and scale service delivery. Why it’s great: Helps financial service professionals leverage technology to grow their business by building and maintaining better client relationships. Curaxian: The fastest and easiest way to find solutions to difficult fraud problems. Why it’s great: There is no easier or more effective way to resolve a fraud attack. Why it’s great: Currency exchange and payments service for your brand. EyeVerify: Has commercialized a software-only biometric method for verifying the identity of mobile users – a safe, simple replacement for passwords. Why it’s great: The password is dead – and now we have the replacement! GoodApril: Online tax planning: your guide to tax savings, helping you take actions today to reduce your taxes next April. Why it’s great: Consumers leave $22 billion in tax saving opportunities on the table each year – GoodApril helps make sure you’re not one of them. Realty Mogul: A marketplace for accredited investors to pool money online and buy shares of pre-vetted investment properties. Why it’s great: Real estate investing made simple. Signifyd: Fights fraud using the Social Graph. By guaranteeing payments, Signifyd provides an insurance for e-commerce merchants. TipRanks: The first online co-browser that aggregates, scrutinizes, and evaluates digitally published stock recommendations. Why it’s great: TipRanks helps provide the answer for all individual investors – should I take this particular person’s financial advice? The TS Score empowers independent traders by diagnosing performance, for traders’ and investors’ benefit. Why it’s great: TrustEgg is the simple, social way to save for your kids. For more information on attending, see our FAQ. To register, visit our FinovateSpring page here.